Beyoncé's Formation World Tour may have stolen the Super Bowl 50 thunder, but her performance in the halftime show alongside Coldplay and Bruno Mars disappointed some fans. Some even went as far as to claim Beyoncé and Bruno Mars lip synced during Super Bowl 50, and that most of the vocal performance was done with backing tracks. That's not actually uncommon in the Super Bowl, where live performing can't be as reliable as in a concert, and in some cases, the NFL insisted on backtracking of instrumentals. So those unplugged guitars Coldplay was miming with actually aren't particularly scandalous — lots of other bands have done the same. However, according to Super Bowl performers The Red Hot Chili Peppers, while they were unable to deliver live instrumentals, the vocals were, in fact, live, which might explain why some fans are seriously PO'd about the possibility that Bey and Bruno may have been lip synching. Chris Martin, however, seems to have gotten fan approval for his more spontaneous-sounding vocals. After the surprise "Formation" video drop earlier on Super Bowl weekend, it seemed like Beyoncé was ready to blow fans' minds. Would there be dozens of surprise appearances? Another surprise album drop or pregnancy announcement? 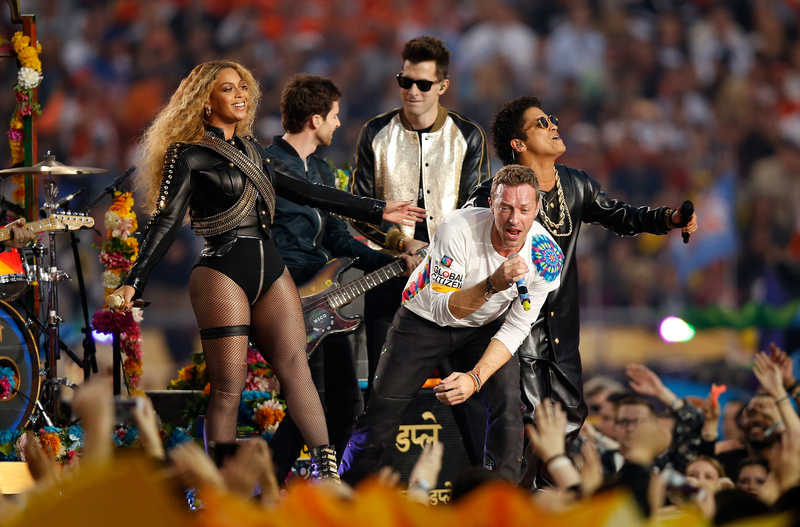 Instead, it wound up being a pretty normal Super Bowl halftime performance. And that was one of the many reasons that the weirdly truncated show wound up being a bit of a disappointment. When the highlight of the performance is a tie between a possibly lip-synched remix and a quick montage of other, longer, better Super Bowl halftime shows, it comes across as a little anticlimactic, especially since when Bey did the halftime show solo in 2013, she killed it, and there was no such backlash. Check out a selection of some very displeased fan reactions below. I'm sure whatever Beyoncé has planned for the Formation World Tour will go a long way in making up for the varied vocals at Super Bowl 50, but until then, it seems the Beyhive is not pleased. Check out the halftime show below to see if you agree with these displeased fans.